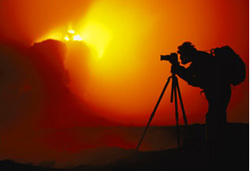 Frans Lanting photographing an erupting volcano in Hawaii. © Brad Lewis. Nature photographer Frans Lanting will share the story behind the making of his multimedia presentation Life: A Journey through Time at an event on Saturday, March 17. Presentations of "The Making of Life: A Journey through Time" will take place at 2 p.m. and 7 p.m. at the Rio Theatre in Santa Cruz. Gary Griggs, director of UCSC's Institute of Marine Sciences, will introduce Lanting at 2 p.m., and Julie Packard, executive director of the Monterey Bay Aquarium, will introduce him at 7 p.m. Tickets for this event are $20 for general admission or $15 for Friends of Long Marine Lab members. For tickets or information, call (831) 459-3800. Tickets are also available at Logos Books & Records in downtown Santa Cruz. Proceeds from the presentations will benefit the Seymour Marine Discovery Center's Ken Norris Memorial Lecture Series, which will begin in the fall of 2007. The lecture series is named in honor of the late Ken Norris, a professor of natural history who inspired Lanting and many other UCSC alumni. "Ken's approach to natural history influenced many people, including myself, and that inspiration is evident in the Life project, which is an experiential way to explore natural history through time," Lanting said. A world-renowned photographer and a photographer-in-residence at National Geographic magazine, Lanting will discuss how he created the acclaimed multimedia performance Life: A Journey through Time. The work, which has also been published as a book, consists of photographs from all over the planet that encapsulate and symbolize Earth's history, from hot springs that harbor ancient microbes to the complex ecosystems of the rain forest. Life: A Journey through Time premiered in Santa Cruz in July 2006. Lanting will tell behind-the-scenes stories and share video footage by his wife, Christine Eckstrom, who coproduced the show with Lanting.